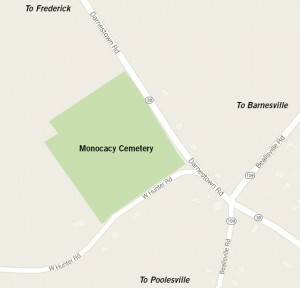 The Monocacy Cemetery is located in the rural crossroads community of Beallsville in western Montgomery County, Maryland. The site is associated with Montgomery County’s early religious history, Civil War activity in the area, and the commemoration of the Civil War. The cemetery reflects a broad spectrum of American funerary customs, with a wide variety of grave styles; from the simple graves of Revolutionary War patriots to the ornate burial plots of the Victorian era to the standardized markers of the twentieth century. The overall design of the cemetery reflects a transition from a small church burial ground, to a picturesque landscape influenced by the “rural” cemetery movement, to an early twentieth-century perpetual care lawn cemetery. The thirteen-acre cemetery continues to be used as an active burial ground. The Monocacy Cemetery Company strives to provide a peaceful environment in which persons may grieve and reflect upon their departed loved ones, as well as a staff that provides high-quality cemetery services. 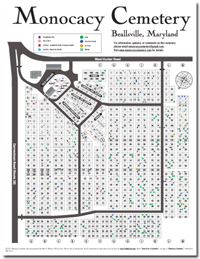 Since 2006, Monocacy Cemetery has been meticulously researched and documented and is currently Maryland’s most-archived cemetery providing fully-digitized burial records, complete photographic resources for every burial location, entire family trees for each person buried, and a gallery of over 3,000 portraits of those buried. On November 5, 2016, we dedicated a Veterans Memorial to honor all of our service members buried throughout Monocacy Cemetery. We have been kindly gifted with a sculpture by a local artist, Brendan O’Neill, who created the piece for his father-in-law who was once buried at Monocacy Cemetery. (He was relocated to another cemetery that didn’t allow standing grave markers). Mr. O’Neill was asked if his sculpture could be repurposed as a veteran memorial and he accepted our request. 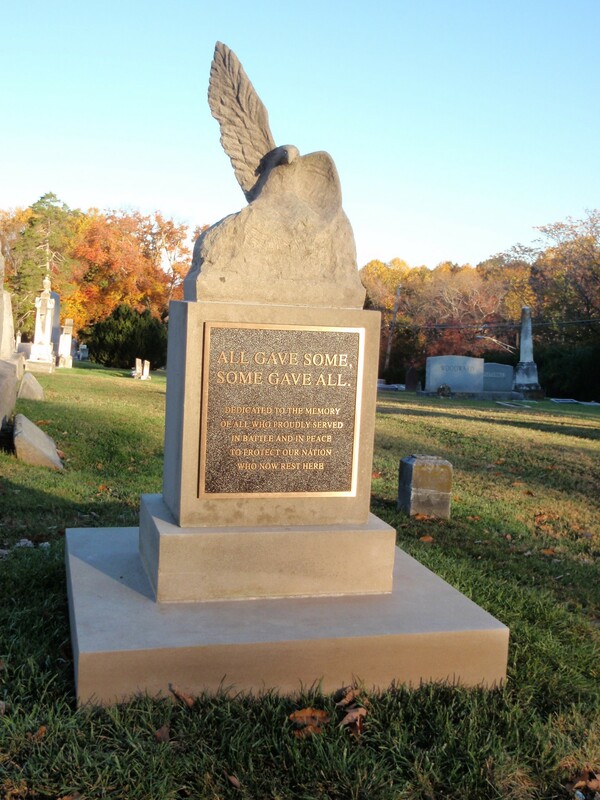 This is now a beautiful addition to our cemetery and we take pride in it being a part of our history here! Back in the Fall of 2006, I joined a website community called Find A Grave that coordinates volunteers to take photos of grave stones throughout the country. My very first photo request was for Ida Marie (Wright) Feeney at Monocacy Cemetery in Beallsville, MD. I had no idea where Beallsville was, nor did I have a clue how to locate her grave marker once I arrived at the cemetery. By luck, she was right next to where I parked my car! The photos were taken in a matter of a minute so I decided to spend a while looking around the rest of the cemetery. I began noticing familiar names — specifically “Poole”. I wondered if this was the Poole family of Poolesville just down the road. My love of history and genealogy kicked in and I was determined to research the connection. As it turned out, I had discovered the founder of Poolesville, Mr. John Poole, buried in Monocacy Cemetery.